WASHINGTON HEIGHTS, Manhattan (WABC) -- A coalition of groups gathered in Manhattan Thursday night to speak out about Domestic Violence Awareness Month. 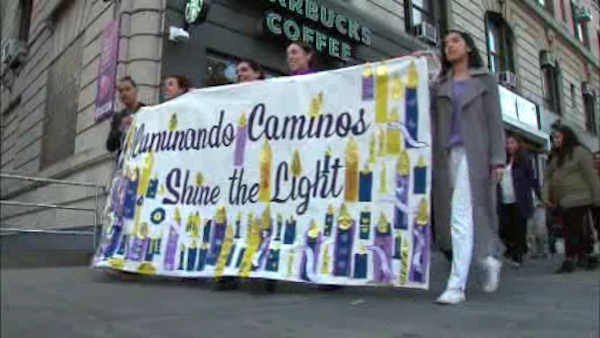 The groups marched down Broadway in Washington Heights, and then stopped at Mitchel Square Park in an event called "Shine the Light" to spotlight the issue. Survivors, faith leaders and victim service providers were all trying to help those who have been victims of domestic violence. The event was organized by members of the Washington Heights/Inwood Coalition Against Domestic Violence, including the Manhattan District Attorney's Office. "We want people to know they're not alone, that there are resources for them, and that we're here to help them," said Mayerling Rivera of the Manhattan D.A. 's office. The third-annual Harlem "Shine the Light" event will take place on Monday at the Harlem State Office Building Plaza.